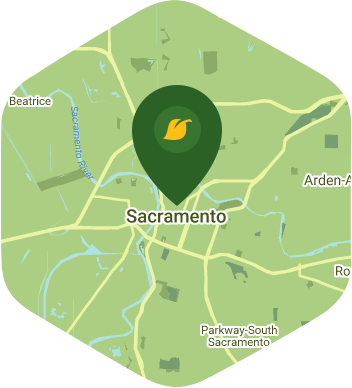 Book a skilled lawn pro in Sacramento. Backed by a total satisfaction guarantee and amazing customer support. California is a pretty big state, but there is probably no better city in Cali for you to settle down in other than Sacramento. With its friendly neighborhoods, great schools, glorious restaurants, and mild winters make it one of the most ideal places to settle down in. You can also relax and take some road trips to San Francisco, Yosemite, and Napa Valley whenever you're feeling a bit adventurous during your free time. Sacramento also has some lovely green spaces that you'd like your own backyard to mimic, but do you have the time to devote to doing this? When it comes to quality yard care service, Lawn Love has all of the time in the world for that. You can chill and relax, and leave the yard work to our independent lawn pros. With just a tap of your phone or click of your mouse you can quickly and easily set up your yard care service through our app and website. Our guys have the experience, tools, and expertise needed to handle any kind of yard care chore. Whether you want a simple routine clean up or lawn mowing, you can count on our yard care service to get it done. Call us now at 916-256-4028, or request a free online quote to know more about Lawn Love's yard care service. He was very friendly, communicated very well and did a great job over all. We were very happy. I really appreciate the job he does when he comes out - It always look very nice. When ever I have suggestions, Jay remembers and follows up! I LOVE my Lawn pro Dennis! His eye for detail is the extra mile! I feel so blessed to have found a true professional! Both my neighbor, whose lawn was also done by Lawn Love and I absolutely loved Wilfredo and his team’s service. Our joined lawns look so beautiful, like a park. Thank you so much, Wilfredo and Lawn Love! Jay is a super nice guy and does a great job! Thank you! Did a great job! Friendly and got my lawns mowed even though it started raining. Very pleased with Jay. Great communication. Addressed my priorities. Went above and beyond My expectations. Said I didn't really need anything done in the backyard but still offered to blow the leaves and clean it up a bit. Very nice. Made our yard look beautiful again! Definitely was knowledgeable and went the extra mile. My yards look great!! Thank you. The lawn and driveway look beautiful! So flexible. Easy to talk to. Very efficient, good work as usual! Great communications, customer service, personal, etc. And went the extra mile. Thank you!! Yard is so neat after Dennis has been here. He did a fantastic job and we will be using Todd again! George was awesome. He went above and beyond his duties. We’d love to have him come over and do our lawn maintenance. Dylan did an awesome job communicating before he arrived, and then did all the work professionally and got the job done right. Thanks for the hard work! George is very likeable and he is very good. Works hard to make the company look good. Rated 4.78 / 5 stars in 1,019 Sacramento customer reviews. There won't be any rain in Sacramento today, which means you'll probably have to water your lawn. Dusk and dawn are the best times to water your lawn (the sun will rise at 6:23 AM and set at 7:47 PM today in Sacramento). Here are some average lawn care prices for homes in Sacramento. Average lawn size 3,131 sq. ft.